Obviously you do-because we all know that is like...70% of what ends up on this blog. Do you also like peanut butter? Chances are good you like that too. C'mon....who doesn't like cookie dough? Am I right? Even if you think you don't like some of those things, these brownies may change your mind. I fed some to a friend of Michael's (who was being a sweetie and fixing my computer), and he is not a pb fan, but he LOVED these brownies. Like-went crazy for them. Told Michael he'd better marry me. He also was sad after he was done eating it. We've all been there. Now...these brownies will cause you to have to do a lot of dishes. And they're super rich. And probably (definitely) not good for you. But they are SO worth it! 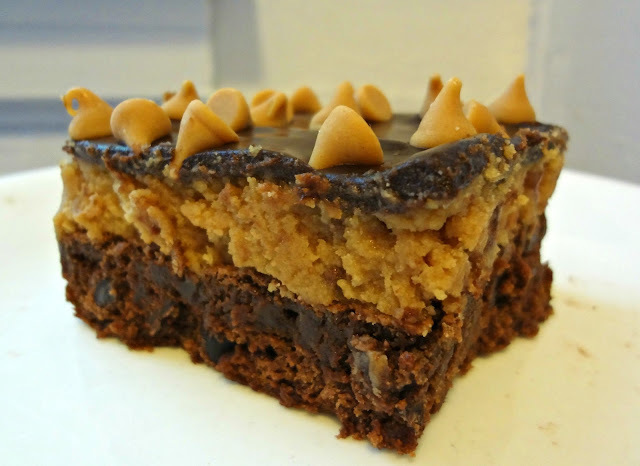 It's like...a fudgy brownie + peanut butter cookie dough + thick, delicious chocolate ganache=YUM. (It actually tastes fairly similar to a certain Buckeye Cake.) I needed to use some of the peanut butter I had laying around the house (PB Crave, specifically), so for the peanut butter cookie dough I actually used PB Crave Cookie Nookie--so the cookie dough factor was amped up. But you can totally use whatever peanut butter you like. If you have some cool flavored pb's this is a super fun way to experiment with diff. combinations. Spray an 8 x 8 pan with non-stick cooking spray. Line the bottom of the pan with a strip of parchment paper, so that it comes up two of the sides that are opposite each other. Spray the parchment with non-stick spray as well. In a small bowl, melt butter and the unsweetened chocolate in the microwave in 30 second intervals-stirring after each-until smooth and fully melted. Stir vanilla into melted chocolate mixture. In a large bowl, using a mixer, beat sugar and eggs. Stir chocolate mixture into the egg/sugar mixture. In a medium bowl whisk flour, baking powder, and salt. Stir dry ingredients and chocolate chips into the wet ingredients. Spread brownie batter into prepared pan. Bake 22-28 minutes, until a toothpick inserted in the middle comes out clean. Allow to cool completely. In a large bowl, using a mixer, beat butter and brown sugar until fluffy. Add milk and peanut butter. Spread evenly over cooled brownies. In a small bowl, microwave chocolate chips, heavy cream, and sugar in 30 second bursts, stirring after each, until melted and smooth. 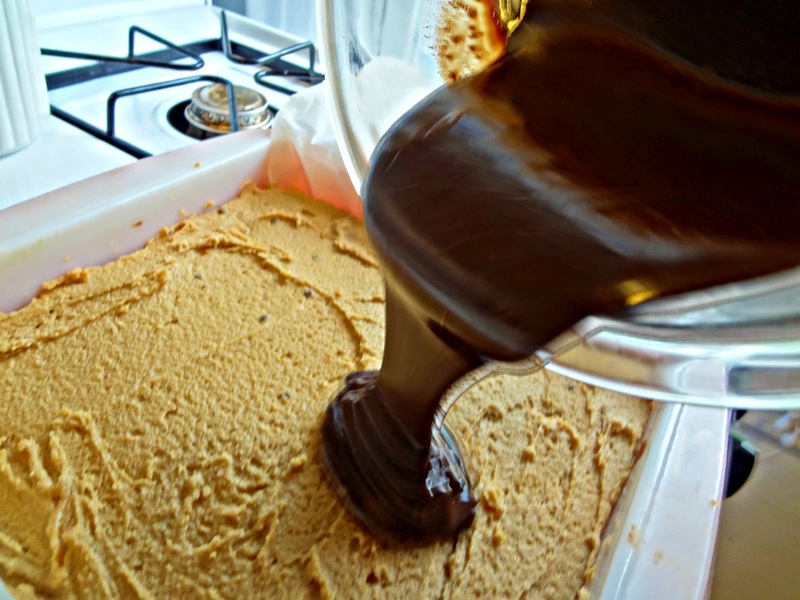 Drizzle/spread, gently, over cookie dough. Sprinkle peanut butter chips on top. Use a a knife to loosen the sides, then grab the parchment paper overhang and remove from pan. 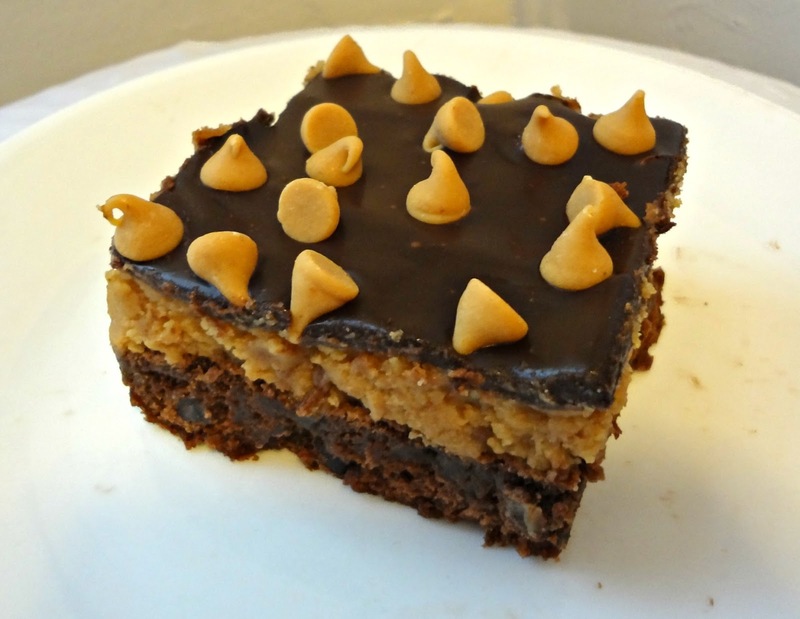 Cut into brownie squares. Go on. Have a bite. You know you want to. 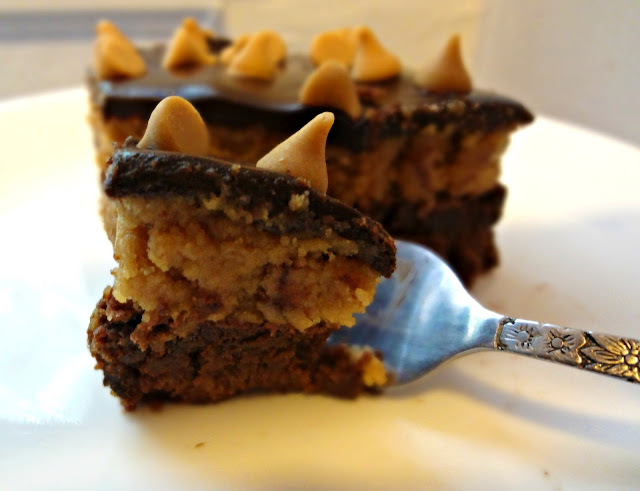 So, the other day I made a brownie cupcake and I used the cookie nookie in the peanut butter frosting. Clearly, both of us are geniuses!!! Ohhh goodnesssss... these look like the peanutbutter brownies that I make that make everyone love me. I'll have to try this variation--but only if I have a hefty glass of milk on hand! ...I think I just passed out a little there. Srsly, though, I don't think I've ever wanted to chew on a computer screen so badly. This is seriously amazing stuff. Oh, wow, this is like the best three desserts ever. All mashed in one pan, this is truly a work of art! Oh you are really creating a craving here and it is not even 5 am! I want this and I would not share...sadly I must go away and find some way to get this thing out of my head. Delicious. Enjoy the weekend! Soon as the house is cleaned, I will hit the kitchen and make these for a Memorial Day treat. Thank you so much for the amazing idea. absolutely! I hope you enjoy them! LOVE these...I'm adding them to my MUST make list....so decadent!!! Yum! Yum! Yum! I have to try these asap!!! I need these now!...preferably in my tummy! Awesome work! YUMMYYYYY!this looks like total indulgence...i feel a craving coming along. Going to add this to the recipe to do list! Oh my goodness, I feel fatter just by looking at your pictures! This is definitely a recipe to make when there's a large group of people coming over, I don't want to get caught alone with a whole batch of these!